Weave through city traffic, on to the motorway, then out to the unknown. 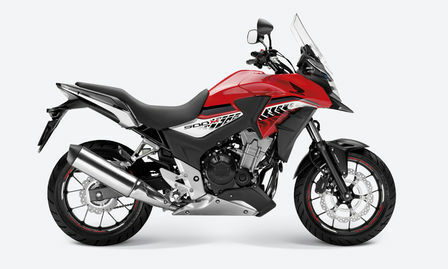 PCP Terms and Conditions: New retail CB500X orders before 31/07/19. Subject to model and colour availability. Offers applicable at participating dealers and are at the promoter's absolute discretion (excluding Channel Islands). Representative example based on 3 years 6.9% PCP. Excess mileage rate applies. Final payment includes £10 option to purchase fee. You do not have to pay the Final Payment if you return the bike at the end of the agreement and you have paid all other amounts due, the bike is in good condition and has been serviced in accordance with the Honda service book and the maximum annual mileage of 4,000 has not been exceeded. Excess mileage rate applies should this be exceeded. Indemnities may be required in certain circumstances. Finance is only available to persons aged 18 or over, subject to status. All figures are correct at time of publication but may be subject to change. Honda Franchise Dealers are credit brokers, not lenders. Credit provided by Honda Finance Europe Plc. Cain Road, Bracknell, Berkshire RG12 1HL. Honda Financial Services is a trading name of Honda Finance Europe Plc. a company registered at Companies House No 03289418. Honda Finance Europe plc is authorised and regulated by the Financial Conduct Authority, Financial Services Register number 312541. The 35kW A2 licence-friendly CB500X adventure machine received a major boost to its crossover style for 2016 with improved wind protection and taller screen; other upgrades included a larger fuel tank, LED lighting, spring preload adjustable front forks and adjustable brake lever. For 2017, the CB500X is newly EURO4-compliant and will be available in 3 new colours. A new exhaust muffler brings a more modern feel. Furthermore, its free-revving, flexible engine performance - with internal design derived from the CBR600RR and CBR1000RR - has gained approval not only from riders stepping up to an A2 licence, but also from experienced motorcyclists looking for a fun, practical and economical all-rounder. For 2016 CB500X evolved substantially with enhanced crossover style, function and desirability to offer a compelling package of all-round capability with an adventurous spirit at an affordable price. While its 471cc DOHC engine - producing 35kW and returning 29.4km/litre - and steel diamond-tube frame remained unchanged, the CB500X’s outlook was revised for 2016 with a much larger windscreen, and the premium touch of LED headlight and taillight. A slightly larger fuel tank extended range, and detail improvements such as the hinged fuel cap, adjustable reach brake lever, redesigned seat and ‘wave’ style ignition key elevated the overall owning experience. The ride was also improved with the addition of adjustable spring preload in the front forks, new damping rates for the rear shock and redesigned shift drum for smoother gear changes. For 2017, three new colour options are available: Sword Silver Metallic, Candy Rose Red and Nitric Orange. A new exhaust muffler brings a more modern feel, and the CB500X also now meets the stringent EURO4 requirements. The allowable limits for exhaust tailpipe pollutants such as carbon monoxide, hyrdrocarbons and nitrous oxide specified by EURO4 are approximately half of those for EURO3. The new LED headlight was physically small but powerful. Its angular outline - crowned by twin position lights and a silver finish on the bottom of the windscreen – gave the CB500X a closer resemblance to Honda’s bigger X machines – the NC750X, VFR800X Crossrunner and VFR1200X Crosstourer. Two-part side panels tied the front and rear design aspects together, and feature painted uppers. Black engine covers underpinned the new design.Extended upwards by approx. 100mm compared to the previous model, the redesigned windscreen offered greater wind and weather protection for the rider’s upper body and features a central duct to equalize pressure and reduce turbulence around the helmet. Two height positions are possible to adjust for rider preference. Fuel capacity grew to 17.5L, extending tank range to over 500km. Detail upgrades for rider benefit included a hinged fuel cap and 5-step adjustable span brake lever. A ‘wave’ key also has a smoother, more premium feel in use. The seat unit is finished with a clear-lensed rear LED light. The comprehensive dash features a digital speedometer, digital bar graph tachometer, odometer, dual trip meters, clock, plus digital fuel level gauge and fuel consumption. HISS (Honda Intelligent Security System) is built in to the ignition. There’s space under the seat to store a U-lock and a bash-plate is fitted to protect the engine underside and exhaust pipe on rough, loose surfaces. Genuine Honda Accessories for the CB500X include heated grips, 35L top box and inner bag, rear carrier, centre stand, knuckle guards, fog lamps, U-Lock and AC charging socket. PGM-FI fuel injection provides superb throttle response; the gasflow route from airbox to exhaust is as straight as possible and a plate in the airbox separates the airflow to each cylinder. Peak power of 35kW arrives at 8,500rpm, with 43Nm torque delivered at 7,000rpm. The crankcase uses centrifugally cast thin-walled sleeves, and the same bore interval as the CBR600RR helps them be as compact and light as possible. Their internal design reduces the ‘pumping’ losses that can occur with a 180° phased firing order. Using the same internal relief structure as that of the CBR1000RR, the oil pump features improved aeration performance, with reduced friction; a deep sump reduces oil movement under hard cornering and braking. Oil capacity is 3.2 litres. A six-speed gearbox mirrors that of its RR cousins which use the same gear change arm structure and link mechanism. In an update for 2016, the shift drum stopper spring load has been revised, along with the shape of the shift drum centre, for smoother, easier gear changing. Wheelbase is 1420mm and rake and trail are set at 26.5°/108mm giving an agile, yet composed steering feel. Mass centralisation, with the engine in very close proximity to the swingarm pivot point, delivers turning agility and optimum front/rear weight distribution ensures stability. Kerb weight is 196kg. For 2016 the 41mm telescopic front fork (with 140mm stroke) gained spring preload adjustment and alongside the Pro-Link rear shock – which has 5-step preload adjustment and revised damping rates – offers the rider flexibility to adjust for loads. Final drive is via 520 sealed chain. Lightweight, 17-inch cast aluminium wheels employ hollow cross-section Y-shaped spokes. Front wheel width is 3.5inch; the rear 4.5inch and tyres are 120/70-ZR17 and 160/60-ZR17. A single front 320mm wavy disc and two-piston brake caliper is matched to a 240mm rear disc and single-piston caliper. ABS is fitted as standard.